You may remember Michael E. Smith’s work from the “BLOOD DRIVE” show that artist Kate Levant organized at Zach Feuer a little more than a year ago. 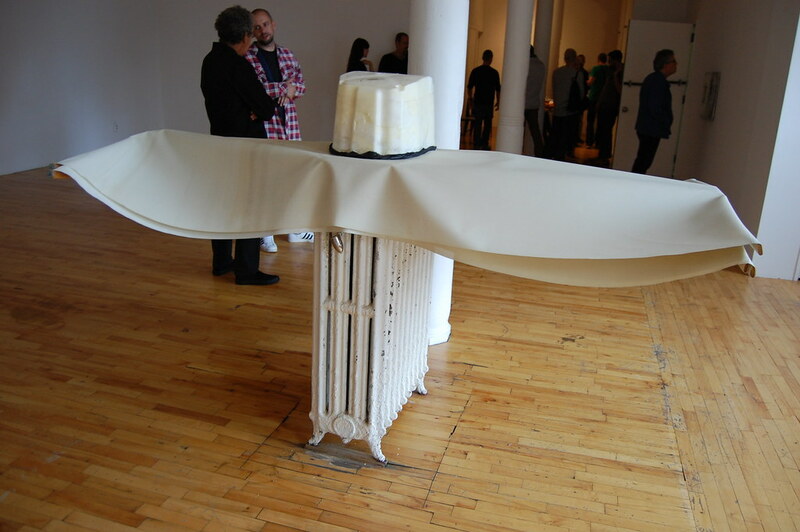 That was one of 2009’s weirdest-looking Chelsea exhibitions, a summer experiment that seemed to have arrived from another planet, or at least a strange, hidden pocket of Yale, where Levant and Smith both studied. Smith’s work looked beat-up and abused but also rigorously constructed. In one piece, a cut of latex and part of a broken television screen nimbly swept over a copy-paper-sized photograph. In another, Smith and Levant together built two tables out of Styrofoam and some blinds. It was odd, and exciting. Michael E. Smith, Untitled, 2010. Industrial foam, plastic surgical gloves, T-shirt, blinds, plank, bucket: 11 1/4 x 17 1/2 x 14 1/2 in., blinds (3): 100 x 44 in. each. Now Smith is back with a solo show down in SoHo at the rapidly ascendant newcomer Clifton Benevento (which showed the superb Ned Vena earlier this year). Smith’s blinds are back, too, propped over the gallery’s radiator with the aid of some plywood and topped with a bucket: a menacing Robert Morris felt coming slowly to life. 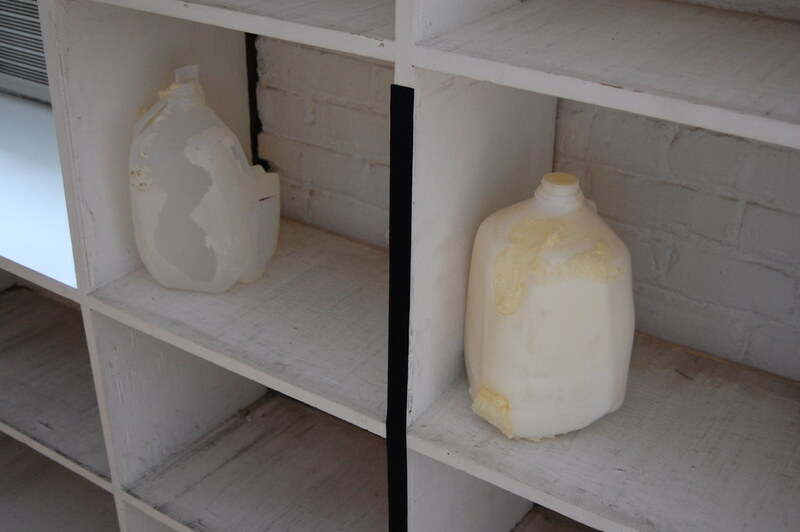 He’s placed two milk jugs on a bookshelf, filling one with industrial foam, which the show’s press release promises will yellow and break down over the course of the exhibition. Frozen representations of decay, that jug is not a bad summary for the show’s prevailing look. Just don’t miss the strip of Velcro in between the milk containers; it’s part of the work too. 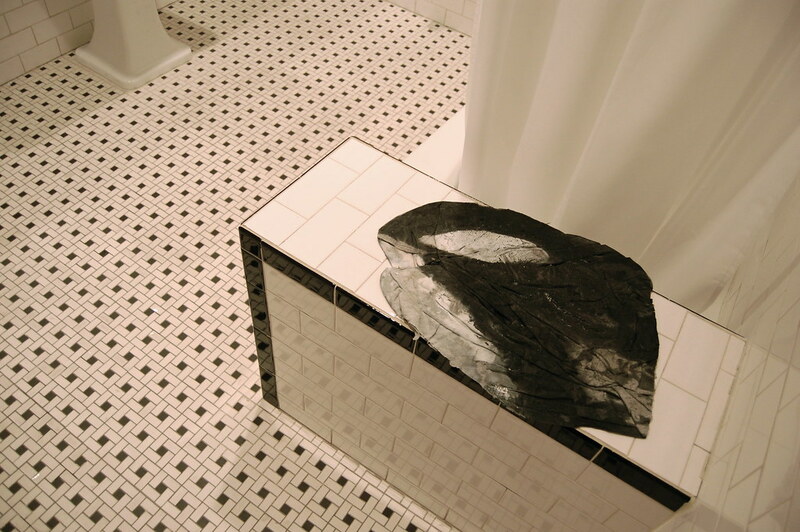 Finish your visit with a trip to the bathroom (or start there, that amenity is rare in SoHo these days). The flat and creepy sculpture Shamu is tucked away there. Nearly flat and constructed out of a rumbled T-shirt touched with plastic and enamel, it looks wet and almost moldy, foreshadowing its potential demise. Michael E. Smith, Untitled, 2010. Fishing hat, thermo rubber, grass clippings, 5 1/2 x 11 1/4 x 9 1/2 in. Michael E. Smith, Shamu, 2010. 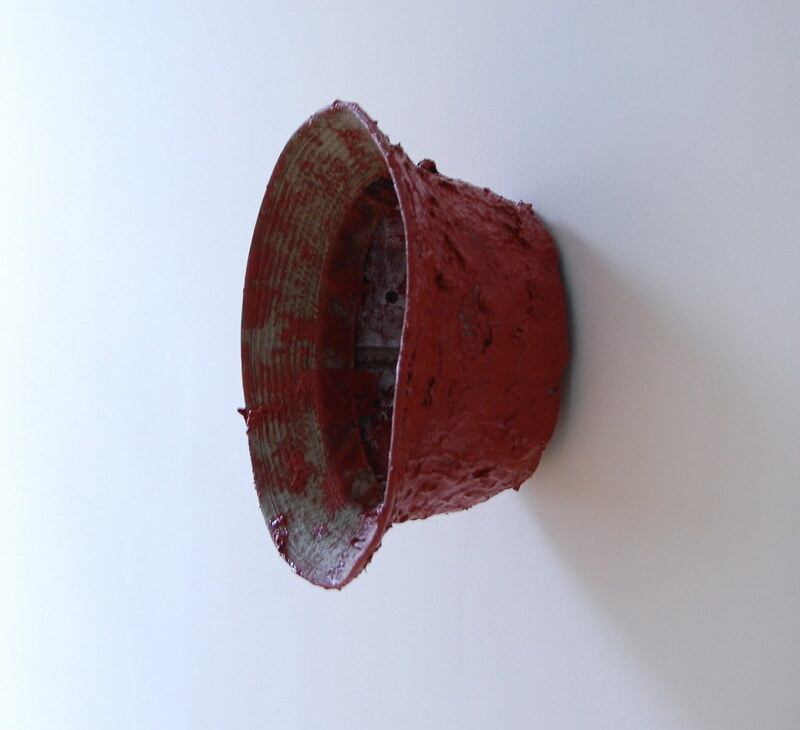 T-shirt, plastic and enamel, 20 1/2 x 15 in.